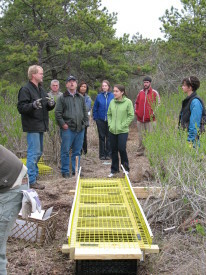 Led by the Waquoit Bay National Estuarine Research Reserve (WBNERR), the Bringing Wetlands to Market (BWM) project is a four-year (2011-2015), $1.3 million research project funded by the NOAA National Estuarine Research Reserve Science Collaborative examining the relationship between salt marshes, climate change, and nitrogen pollution. The BWM project is at the forefront of blue carbon research and is providing cutting edge science and tools to help coastal managers and policy makers leverage blue carbon to achieve broader wetlands management, restoration, and conservation goals through verified carbon markets and climate and conservation policy avenues. The BWM relies on a multidisciplinary team of scientists, policymakers, economists, and end users. 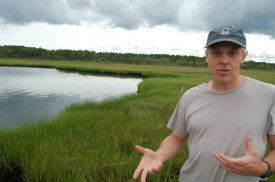 The project includes four primary components 1) field investigations 2) development of a first of it’s kind methodology for securing credits for coastal blue carbon through verified carbon markets 3) development of an innovative model for predicting greenhouse gases in coastal wetlands similar to those found at WBNERR 4) an analysis of the cost and benefits of a real-life blue carbon project. To do this work, the team is using cutting edge science to quantify greenhouse gas emissions and carbon sequestration in coastal wetlands and to predict greenhouse gas fluxes across a range of environmental settings. It is also elevating the importance of blue carbon and developing new tools and resources to enable coastal managers and policymakers to leverage blue carbon to achieve broader wetlands management, restoration, and conservation goals.